There were multiple Simplex models, the largest being the 60 HP model. This is the mid-range 28/32HP – meaning it is powered by a 32 horsepower 5.3-liter straight-four. It will do 65 mph+. Imagine being able to keep up on the interstate today in a car from 1904… that has dual chain drive. When new, a Simplex would have cost roughly $7,500 – an absolute fortune in 1904. This example was sold new in England and later used by the British military during WWI. It was discovered on a farm in the 1970s and has been completely restored (and “refurbished” a couple of times since the restoration was completed). It’s extremely usable and has seen its fair share of use at the London-to-Brighton run. In total, 1,500 Mercedes-Simplex cars were built and only 20 pre-1905 Mercedes cars still survive. Only six of those are this model. It’s a beautiful machine and should bring between $2,500,000-$3,000,000. Click here for more info and here for more from this sale. 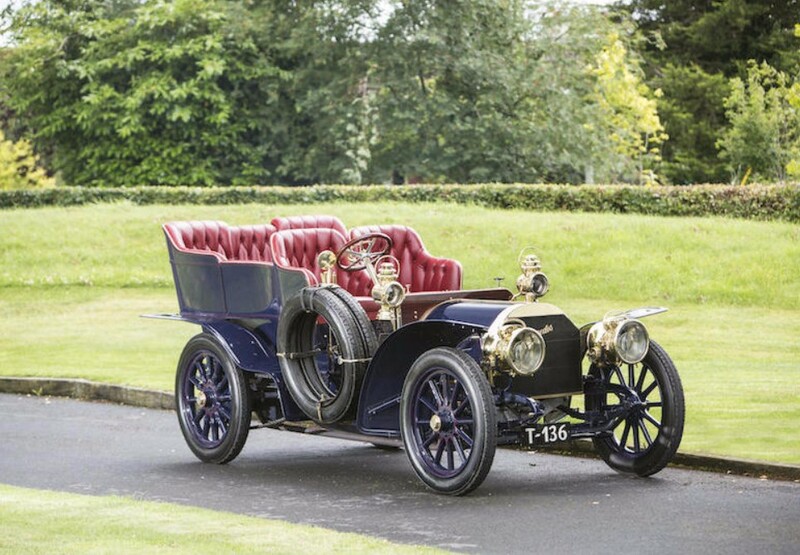 This entry was posted in Uncategorized and tagged 1904, 28/32, auctions, Bonhams, cars, classic cars, five-seat, mercedes-benz, mercedes-simplex, rear-entrance, tonneau by classiccarweekly. Bookmark the permalink.